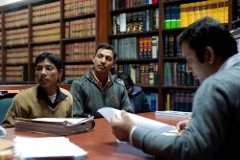 "Aditya" (left), who was accused of robbery and murder along with three other men, discusses his case with IBJ staff and family. He originally received a 30-year imprisonment sentence, which IBJ lawyer Ajay Verma was able to overturn after highlighting flaws in the prosecution's case. According to the prosecution’s case, the four aforementioned accused had allegedly hatched a criminal conspiracy to commit robbery and in the process allegedly killed a person, taking various objects such as a gold ring, gold chain and a wrist watch. The Trial Court convicted the four accused, giving them to life sentence with a rider of a minimum of 30-years of actual imprisonment with no possibility of remission. According to the basic tenet of criminal law, the prosecution needs to establish their case beyond a reasonable doubt to secure a conviction. Yet there were no eyewitnesses present during the crime, nor any direct evidence that could implicate the four accused. Instead, the Trial Court reached its decision based on one alleged extra-judicial confession, the recovery of stolen objects from the accused, and the recovery of one mobile phone and its call records. The prosecution alleged that Aditya gave an extra-judicial confession to the deceased’s driver, one of the prosecution witnesses. Although the Supreme Court of India has declared on multiple occasions that an extra-judicial confession is very weak evidence, neither the prosecution nor the trial court considered it to be weak. Though the prosecution provided no corroboration of the extra-judicial confession, yet the trial court relied upon it as a valuable piece of evidence. The court also relied upon the recovery of incriminating evidence from the accused as another valuable piece of evidence—but the deceased’s family did not report the theft of these objects for more than a month after the commission of the crime. The prosecution never bothered questioning this lapse of time between the crime and the report of the theft. All the accused were held jointly liable under Section 120B of the Indian Penal Code, which addresses criminal conspiracy. Although no direct evidence is usually needed to establish the offence of criminal conspiracy, the prosecution is still required to establish the offence through clear and cogent evidence. The basic principles of Fair Trial are the right to be presumed innocent and the right to be tried without undue delay, both of which were disregarded in this instance. Aditya spent about in total 6 years in prison, first as an undertrial and subsequently as a convict. But his family hurt from his imprisonment too. He was the sole bread winner for his aged parents, wife and school-going daughter. Though his income was meager, it still provided sustenance to his entire family, which was lost once he was incarcerated. When the case came up before the Honorable High Court of Delhi in Appeal, IBJ India Fellow Mr. Ajay Verma, Advocate, mentioned these flaws in the prosecution’s case and the trial court’s decision. The High Court looked into this evidence, concluding that there were not only lapses in the investigation but the evidence was not strong enough to confirm the guilt of the accused beyond the shadow of reasonable doubt. 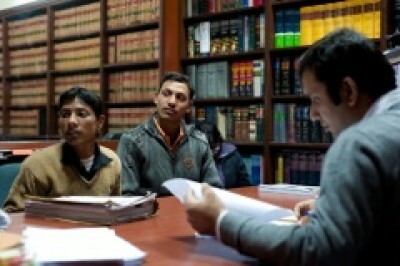 Thus, all the four accused were acquitted of all charges and ordered to be set free. This case is a glaring example of the shortcomings that plague the Judiciary (the lower judiciary in particular,) clearly showing how the Trial Court failed to appreciate the evidence in proper light and held four innocent persons guilty on the basis of weak evidence.